Those who live in Toronto know that the city's population is growing rapidly. Whether it be the cranes that dot the sky or the traffic on the roads, you don't need statistics to feel the effect of the increased number of people who call this place home. But beyond this lived experience, what does Toronto's population boom look like? The last census with detailed population data related to this city dates back to 2011. That's an eternity when you consider the breakneck speed at which Toronto is growing, but a new report from the Canadian Urban Institute offers insight into the city's increased density via population profiles of 16 downtown neighbourhoods. There's plenty of interesting information about each area in the report, but the bird's eye view is perhaps most fascinating. 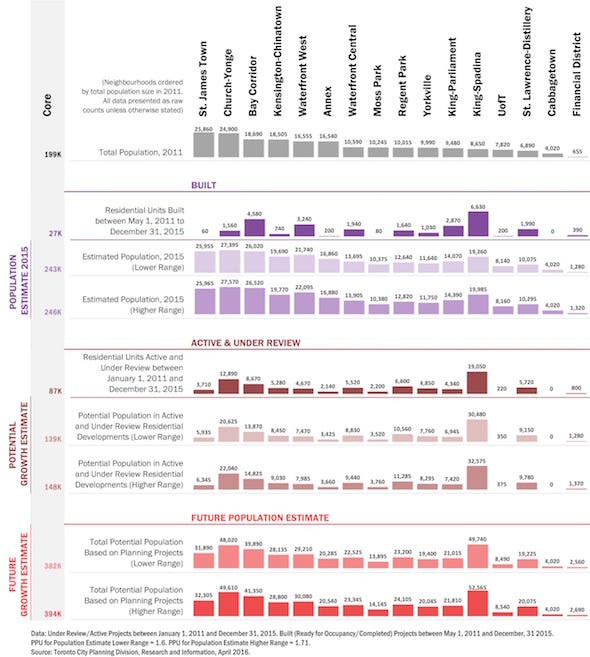 Without recent census data as a guide, the study uses development pipeline data to track "all built, active, and under review projects over a five-year timeframe, 2011 to 2015." 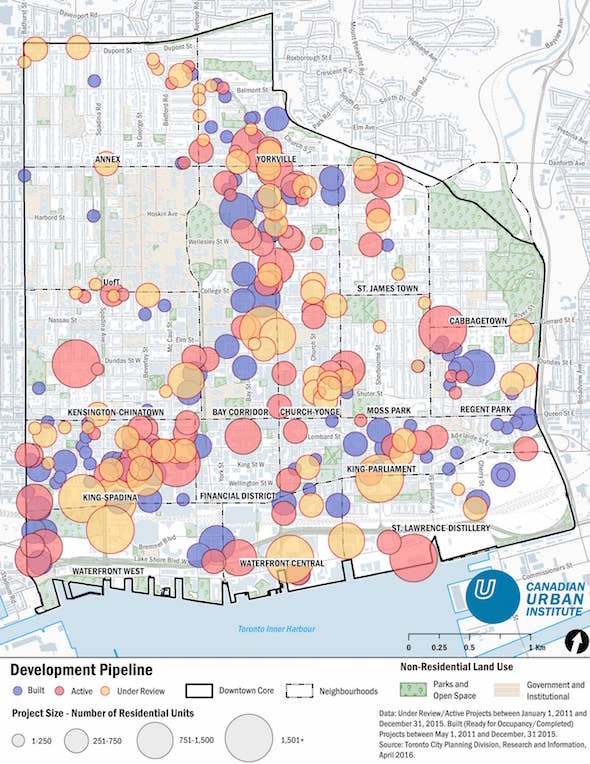 "There were a total of 27,150 built residential units in the development pipeline dataset for the Downtown, which when added to the 2011 base population of 199,405 is the equivalent of an estimated population downtown in 2015 between 242,845 to 245,830. 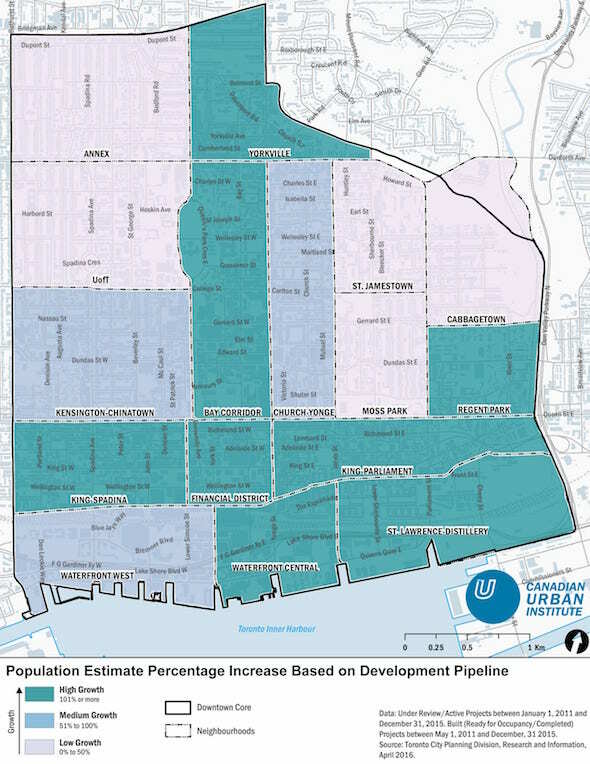 There were a total of 86,660 active and under review residential units in the development pipeline dataset for the Downtown, which is the equivalent of a potential population growth of 138,655 to 148,190 over the 2015 population estimate. Adding this to the 2015 population estimate results in a total potential future population of between 381,500 to 394,020." Obviously this isn't the most rigorous way to estimate population given the other variables involved (e.g. whether built units will be occupied), but it does paint an intriguing picture of a city in the midst of a boom.